As part of the 2018.3 release of the VeSyMA – Engines library, some new features and improvements have been implemented. One of the main ones is the rationalisation of the sub busses and of the bus signals. Until now, several busses were used throughout the library to pass signals from one subsystem to another. These busses were sorted hierarchically, for example: controlBus > engineBus > intakeBus > plenumBus. 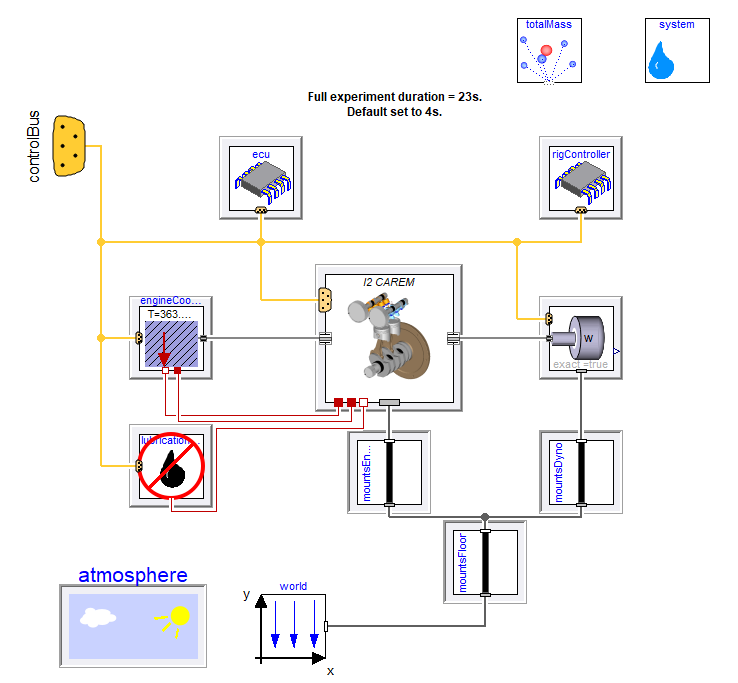 Figure: Engine experiment as part of the Autumn release of the VeSyMA – Engines library. It has been decided that, from now on, only 3 busses would be used to avoid confusion and help improve usability: the controlBus and two sub-busses, the engineBus and engineControlBus. These 3 busses are standard busses from the open source library VehicleInterfaces, that is commonly used as a base platform for vehicle architecture modelling. The number of signals passing through these busses has also been reduced to contain quantities that would actually be sensed/measured in a real engine. Non-physical or non-measurable quantities have been removed from the busses and are either passed using real connectors or are calculated from the core set of engine signals. The engineBus comprises of the quantities sensed in the engine (plenum pressure, intake air mass flow rate, …) whilst the engineControlBus regroups the signals used to control the engine (throttle opening, injector opening, …). In doing so, the number of equations in the engine models has dramatically reduced and so has the simulation time. A 20% speed improvement can for instance be observed on a 2-cylinder crank-angle resolved engine following an input speed profile transient, using a variable-step solver. The usability of the library has also been improved as the signals are now easier to find within the busses. This new release of the VeSyMA – Engines library will be available as part of the Autumn release of the Claytex libraries.